I LOVE pasta. I mean it's not something rare but I genuinely have a deep appreciation for how simple ingredients like flour, water, and eggs can make something so delicious and versatile. Pasta comes in a multitude of shapes, colors, and sizes. However, there is one thing intrinsically about any pasta-- It can absorb flavor. 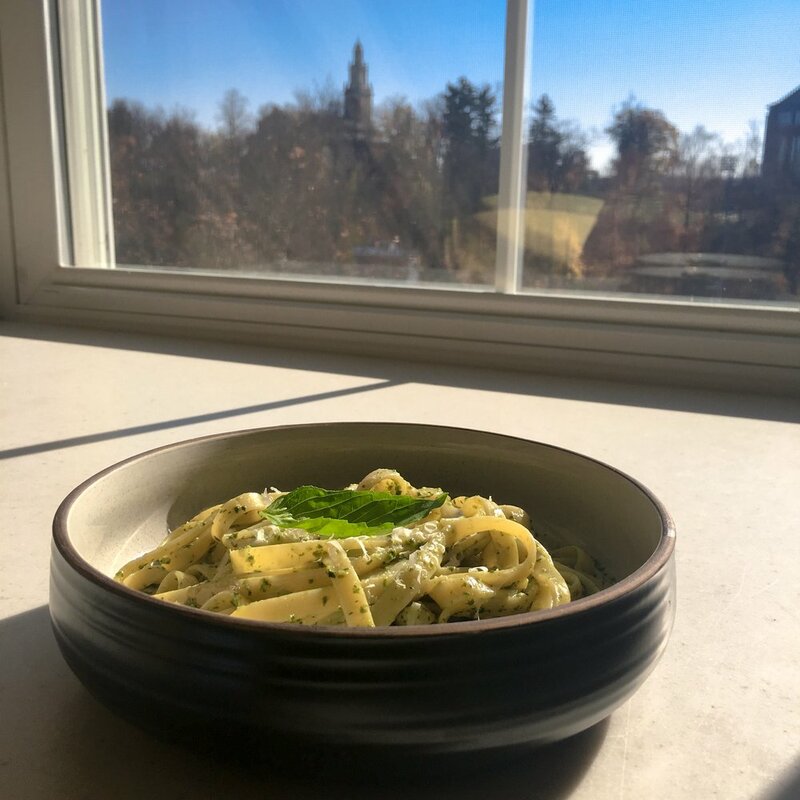 The reason why we love pasta is never just the pasta alone, it's the flavor that we infuse it with (though there are some people like my roommate that can eat it with no flavor and if he is really hungry, raw). It's the sauce that has made Italian food so versatile. With a base like a flavorless noodle, the real magic is in giving the base character. My go to sauce is Pesto. It's traditionally a basil, pine nut, and olive oil infusion that has a variety of new combinations. Its fresh, light on the palette and works extremely well with long strand pastas such pappardelle or linguine. While its light on the palette, both the olive oil and pine nuts give it the fat content of a filling meal. Which means, that it really doesn't need an accompaniment of a protein (such as chicken or shrimp) or veggies. I usually cut the fat with lemon and fresh cherry tomatoes, as a way to introduce some fresh elements to the dish. When to make this dish? When you are alone, hungry, and are in the middle of a master of none binge session. Date night: its easy enough that you don't get into a fight with your boo thang but intricate enough that you don't think it was take out. When you have a lot of people coming over: It's not hard to find the ingredients to make a large quantity of this dish and its very filling. Only caveat, you might have to add veggies or protein because not everyone can appreciate a simple dish. Give the recipe a try. It's a little different and based on my taste. Being an Italian sauce you can literally change any of the elements. Let me know how it was! Wash the basil well rinsing about 3 times and submerge water as you prepare all the other ingredients. In the mean time, start boiling water and cook pasta as per the instructions. A simple warm meal perfect for a winter dinner or a summer lunch! There is a thin line between easy pasta and extraordinary pasta. This is firmly in the middle.